(e-Book) Practice Answer Sheet Booklet for UPSC Mains Exam | IAS EXAM PORTAL - India's Largest Community for UPSC Exam Aspirants. Today we are launching this innovative product specially designed for Our IAS Main Exam members who want to practice Mains descriptive paper beforehand. 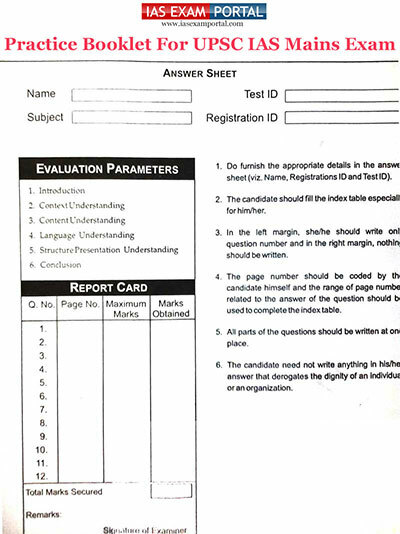 Usually candidates don't understand the Answer Sheet format which gives them last minute problems. These Sample Answer Sheets will give you enough idea about the words count and side margins which you need to understand and practice before you actually sit for exam. Its a free PDF copy which can be printed as per your needs.